These rugs are attractive. They have a nonslip backing so they won’t slip on my hardwood floors. I have several rugs made by this manufacturer. They are all beautiful, do not shed, and hold up to many vacuums. This particular set is washable. I would purchase again. 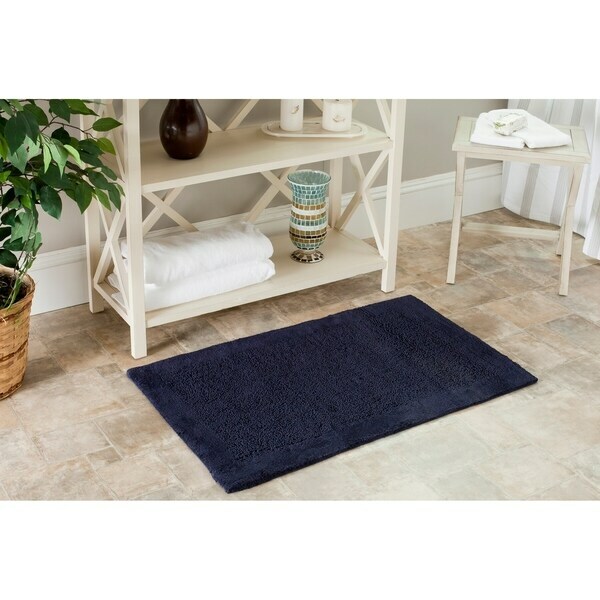 Turn any bathroom into a spa with an ultra luxurious extra densebath rug. Bath rug measures 21 inches high x 34 inches wide andthis item comes in a set of two. Color comes in a navy. Machinewashable. Superior 2400-gram bath mats are both plush andabsorbent. A latex non-slip backing ensures rug will hold in place.Rugs are safe to machine wash and will not fade. Dimensions 21.0 In. X 6.0 In. X 6.0 In. These bath rugs are great quality. They are plush and thick and the "navy" is a true navy color. The only issue I see is that upon washing them, they threw off a ton of fibers/lint. My dryer is still recovering. However, I'm hoping subsequent washes will be better. Nice rugs for the money. These rugs were just the right color navy that I was looking for in a rug. They look very nice in an all white bathroom with dark blue accents. The color and size are perfect for what I needed. They are a bit thinner than I had anticipated, but for the price... So far no shedding, but I have not washed them yet. I would prefer something in the Windsor Home Memory Foam Shag Bath Mat. If my husband had not removed the tags, I would have returned them. These are just not as quality looking as the Windsor. I purchased these mats for use in our bedroom in a spot where there is no area rug. I chose them because of the "no slip" backing. They are thick and pretty-and don't look like they belong in a bathroom! Just what we needed. very nice rugs, thick enough for our grands...color is super and soft! Extrememly durable and holds up well after many washes in a washing machine. What you see is what you get, and it won't fall apart. The color has stayednin tact nicely too. These rugs not only show every piece of lint but when washed they leave so much lint in the washer and dryer you may as well throw them away then to wash them when they get dirty.